It's worth repeating the book description first. The book does not cover all the tools and features of Adobe Illustrator, the vector drawing software. This a basic introductory guide to creating vector work, as suggested by the cover. More specifically, it focuses on using the Pen tool (understanding how Bezier curves work) and the philosophy of creating vector work. The author's philosophy is that you should be able to draw well enough and conceptualize ideas on paper before turning them to vector using software. It always helps to draft things out on paper first. The examples shown in the book are from Adobe Illustrator software but the knowledge should be applicable to other vector software since it's mostly about using the Pen tool. The 2 hours plus video tutorials on the DVD teach by showing so they are pretty helpful. Sometimes concepts are quicker to grasp just by watching. Exercise files are in Adobe Illustrator CS2 and CS4 file formats. 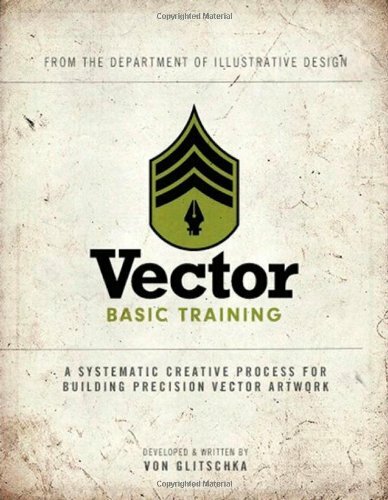 I will not recommend this as the first book to get if you are just starting to learn vector drawing. Begin with a software dedicated book first, such as the Adobe Illustrator Classroom in a Book series (US | CA | UK | DE | FR | IT | ES | BDUS | BDUK), which will give a good overview and working knowledge of the drawing tools and features available. Only when you feel that you need additional Pen tool training would I then suggest you get Vector Basic Training. Thanks for the review. One of the better ones I may add and I'd agree with you that it's not a book for beginners who have never used Ai.